This article is about the phenomenon in general. For nuclear EMP weapons, see Nuclear electromagnetic pulse. An electromagnetic pulse (EMP), also sometimes called a transient electromagnetic disturbance, is a short burst of electromagnetic energy. Such a pulse's origination may be a natural occurrence or man-made and can occur as a radiated, electric, or magnetic field or a conducted electric current, depending on the source. Weapons have been developed to deliver the damaging effects of high-energy EMP. The type of energy (radiated, electric, magnetic or conducted). The range or spectrum of frequencies present. Pulse waveform: shape, duration and amplitude. The last two of these, the frequency spectrum and the pulse waveform, are interrelated via the Fourier transform and may be seen as two different ways of describing the same pulse. Due to Maxwell's equations, a pulse of any one form of electromagnetic energy will always be accompanied by the other forms, however in a typical pulse one form will dominate. In general, only radiation acts over long distances, with the others acting over short distances. There are a few exceptions, such as a solar magnetic flare. A pulse of electromagnetic energy typically comprises many frequencies from DC (zero Hz) to some upper limit depending on the source. The range defined as EMP, sometimes referred to as "DC to daylight", excludes the highest frequencies comprising the optical (infrared, visible, ultraviolet) and ionizing (X and gamma rays) ranges. Some types of EMP events can leave an optical trail, such as lightning and sparks, but these are side effects of the current flow through the air and are not part of the EMP itself. The waveform of a pulse describes how its instantaneous amplitude (field strength or current) changes over time. Real pulses tend to be quite complicated, so simplified models are often used. Such a model is typically described either in a diagram or as a mathematical equation. Most electromagnetic pulses have a very sharp leading edge, building up quickly to their maximum level. The classic model is a double-exponential curve which climbs steeply, quickly reaches a peak and then decays more slowly. However, pulses from a controlled switching circuit often approximate the form of a rectangular or "square" pulse. EMP events usually induce a corresponding signal in the surrounding environment or material. Coupling usually occurs most strongly over a relatively narrow frequency band, leading to a characteristic damped sine wave. Visually it is shown as a high frequency sine wave growing and decaying within the longer-lived envelope of the double-exponential curve. A damped sinewave typically has much lower energy and a narrower frequency spread than the original pulse, due to the transfer characteristic of the coupling mode. In practice, EMP test equipment often injects these damped sinewaves directly rather than attempting to recreate the high-energy threat pulses. In a pulse train, such as from a digital clock circuit, the waveform is repeated at regular intervals. A single complete pulse cycle is sufficient to characterise such a regular, repetitive train. An EMP arises where the source emits a short-duration pulse of energy. The energy is usually broadband by nature, although it often excites a relatively narrow-band damped sine wave response in the surrounding environment. Some types are generated as repetitive and regular pulse trains. Different types of EMP arise from natural, man-made, and weapons effects. Lightning electromagnetic pulse (LEMP). The discharge is typically an initial huge current flow, at least mega-amps, followed by a train of pulses of decreasing energy. Electrostatic discharge (ESD), as a result of two charged objects coming into close proximity or even contact. Meteoric EMP. The discharge of electromagnetic energy resulting from either the impact of a meteoroid with a spacecraft or the explosive breakup of a meteoroid passing through the Earth's atmosphere. Coronal mass ejection (CME). A burst of plasma and accompanying magnetic field, ejected from the solar corona and released into the solar wind. Sometimes referred to as a Solar EMP. Switching action of electrical circuitry, whether isolated or repetitive (as a pulse train). Electric motors can create a train of pulses as the internal electrical contacts make and break connections as the armature rotates. Gasoline engine ignition systems can create a train of pulses as the spark plugs are energized or fired. Continual switching actions of digital electronic circuitry. Power line surges. These can be up to several kilovolts, enough to damage electronic equipment that is insufficiently protected. Nuclear electromagnetic pulse (NEMP), as a result of a nuclear explosion. A variant of this is the high altitude nuclear EMP (HEMP), which produces a secondary pulse due to particle interactions with the Earth's atmosphere and magnetic field. Non-nuclear electromagnetic pulse (NNEMP) weapons. Lightning is unusual in that it typically has a preliminary "leader" discharge of low energy building up to the main pulse, which in turn may be followed at intervals by several smaller bursts. ESD events are characterised by high voltages of many kV but small currents and sometimes cause visible sparks. ESD is treated as a small, localised phenomenon, although technically a lightning flash is a very large ESD event. ESD can also be man-made, as in the shock received from a Van de Graaff generator. An ESD event can damage electronic circuitry by injecting a high-voltage pulse, besides giving people an unpleasant shock. Such an ESD event can also create sparks, which may in turn ignite fires or fuel-vapour explosions. For this reason, before refuelling an aircraft or exposing any fuel vapour to the air, the fuel nozzle is first connected to the aircraft to safely discharge any static. The switching action of an electrical circuit creates a sharp change in the flow of electricity. This sharp change is a form of EMP. Simple electrical sources include inductive loads such as relays, solenoids, and the brush contacts in electric motors. Typically these send a pulse down any electrical connections present, as well as radiating a pulse of energy. The amplitude is usually small and the signal may be treated as "noise" or "interference". The switching off or "opening" of a circuit causes an abrupt change in the current flowing. This can in turn cause a large pulse in the electric field across the open contacts, causing arcing and damage. It is often necessary to incorporate design features to limit such effects. Electronic devices such as vacuum tubes or valves, transistors and diodes can also switch on and off very quickly, causing similar issues. One-off pulses may be caused by solid-state switches and other devices used only occasionally. However, the many millions of transistors in a modern computer may switch repeatedly at frequencies above 1 GHz, causing interference which appears to be continuous. A nuclear electromagnetic pulse is the abrupt pulse of electromagnetic radiation resulting from a nuclear explosion. The resulting rapidly changing electric fields and magnetic fields may couple with electrical/electronic systems to produce damaging current and voltage surges. The intense gamma radiation emitted can also ionize the surrounding air, creating a secondary EMP as the atoms of air first lose their electrons and then regain them. NEMP weapons are designed to maximize such EMP effects as the primary damage mechanism, and some are capable of destroying susceptible electronic equipment over a wide area. A high-altitude electromagnetic pulse (HEMP) weapon is a NEMP warhead designed to be detonated far above the Earth's surface. The explosion releases a blast of gamma rays into the mid-stratosphere, which ionizes as a secondary effect and the resultant energetic free electrons interact with the Earth's magnetic field to produce a much stronger EMP than is normally produced in the denser air at lower altitudes. Non-nuclear electromagnetic pulse (NNEMP) is a weapon-generated electromagnetic pulse without use of nuclear technology. Devices that can achieve this objective include a large low-inductance capacitor bank discharged into a single-loop antenna, a microwave generator, and an explosively pumped flux compression generator. To achieve the frequency characteristics of the pulse needed for optimal coupling into the target, wave-shaping circuits or microwave generators are added between the pulse source and the antenna. Vircators are vacuum tubes that are particularly suitable for microwave conversion of high-energy pulses. NNEMP generators can be carried as a payload of bombs, cruise missiles (such as the CHAMP missile) and drones, with diminished mechanical, thermal and ionizing radiation effects, but without the consequences of deploying nuclear weapons. The concept of the explosively pumped flux compression generator for generating a non-nuclear electromagnetic pulse was conceived as early as 1951 by Andrei Sakharov in the Soviet Union, but nations kept work on non-nuclear EMP classified until similar ideas emerged in other nations. The large forces generated by electromagnetic pulses can be used to shape or form objects as part of their manufacturing process. Minor EMP events, and especially pulse trains, cause low levels of electrical noise or interference which can affect the operation of susceptible devices. For example, a common problem in the mid-twentieth century was interference emitted by the ignition systems of gasoline engines, which caused radio sets to crackle and TV sets to show stripes on the screen. Laws were introduced to make vehicle manufacturers fit interference suppressors. At a high voltage level an EMP can induce a spark, for example from an electrostatic discharge when fuelling a gasoline-engined vehicle. Such sparks have been known to cause fuel-air explosions and precautions must be taken to prevent them. A large and energetic EMP can induce high currents and voltages in the victim unit, temporarily disrupting its function or even permanently damaging it. A powerful EMP can also directly affect magnetic materials and corrupt the data stored on media such as magnetic tape and computer hard drives. Hard drives are usually shielded by heavy metal casings. Some IT asset disposition service providers and computer recyclers use a controlled EMP to wipe such magnetic media. A very large EMP event such as a lightning strike is also capable of damaging objects such as trees, buildings and aircraft directly, either through heating effects or the disruptive effects of the very large magnetic field generated by the current. An indirect effect can be electrical fires caused by heating. Most engineered structures and systems require some form of protection against lightning to be designed in. The damaging effects of high-energy EMP have led to the introduction of EMP weapons, from tactical missiles with a small radius of effect to nuclear bombs tailored for maximum EMP effect over a wide area. 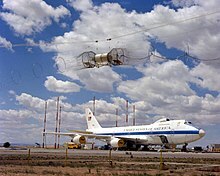 EMP simulator HAGII-C testing a Boeing E-4 aircraft. 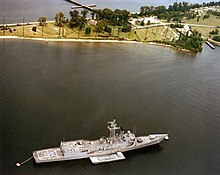 EMPRESS I (antennas along shoreline) with USS Estocin (FFG-15) moored in the foreground for testing. Like any electromagnetic interference, the threat from EMP is subject to control measures. This is true whether the threat is natural or man-made. Therefore, most control measures focus on the susceptibility of equipment to EMP effects, and hardening or protecting it from harm. Man-made sources, other than weapons, are also subject to control measures in order to limit the amount of pulse energy emitted. The discipline of ensuring correct equipment operation in the presence of EMP and other RF threats is known as electromagnetic compatibility (EMC). To test the effects of EMP on engineered systems and equipment, an EMP simulator may be used. Induced pulses are of much lower energy than threat pulses and so are more practicable to create, but they are less predictable. A common test technique is to use a current clamp in reverse, to inject a range of damped sine wave signals into a cable connected to the equipment under test. The damped sine wave generator is able to reproduce the range of induced signals likely to occur. Sometimes the threat pulse itself is simulated in a repeatable way. The pulse may be reproduced at low energy in order to characterise the victim's response prior to damped sinewave injection, or at high energy to recreate the actual threat conditions. A small-scale ESD simulator may be hand-held. Bench- or room-sized simulators come in a range of designs, depending on the type and level of threat to be generated. At the top end of the scale, large outdoor test facilities incorporating high-energy EMP simulators have been built by several countries. The largest facilities are able to test whole vehicles including ships and aircraft for their susceptibility to EMP. Nearly all of these large EMP simulators used a specialized version of a Marx generator. Examples include the huge wooden-structured ATLAS-I simulator (also known as TRESTLE) at Sandia National Labs, New Mexico, which was at one time the world's largest EMP simulator. Papers on this and other large EMP simulators used by the United States during the latter part of the Cold War, along with more general information about electromagnetic pulses, are now in the care of the SUMMA Foundation, which is hosted at the University of New Mexico. The US Navy also has a large facility called the Electro Magnetic Pulse Radiation Environmental Simulator for Ships I (EMPRESS I). High-level EMP signals can pose a threat to human safety. In such circumstances, direct contact with a live electrical conductor should be avoided. Where this occurs, such as when touching a Van de Graaf generator or other highly-charged object, care must be taken to release the object and then discharge the body through a high resistance, in order to avoid the risk of a harmful shock pulse when stepping away. Very high electric field strengths can cause breakdown of the air and a potentially lethal arc current similar to lightning to flow, however electric field strengths of up to 200 kV/m (Kilovolts per metre) are regarded as safe. The popular media often depict EMP effects incorrectly, causing misunderstandings among the public and even professionals. Official efforts have been made in the U.S. to disprove these misconceptions. ^ Close, S.; Colestock, P.; Cox, L.; Kelley, M.; Lee, N. (2010). "Electromagnetic pulses generated by meteoroid impacts on spacecraft". Journal of Geophysical Research. 115 (A12): A12328. Bibcode:2010JGRA..11512328C. doi:10.1029/2010JA015921. ^ Chandler, Charles. "Meteoric Airbursts: General Principles". QDL blog. Retrieved 30 December 2014. ^ "EMPACT America, Inc. - Solar EMP". 26 July 2011. Archived from the original on 26 July 2011. Retrieved 23 November 2015. ^ Howard, J.; Uman, M. A.; Biagi, C.; Hill, D.; Rakov, V. A.; Jordan, D. M. (2011). "Measured close lightning leader step electric field derivative waveforms" (PDF). Journal of Geophysical Research. 116 (D8): D08201. Bibcode:2011JGRD..116.8201H. doi:10.1029/2010JD015249. ^ "A Basic Primer in Lightning Effects and Protection" (PDF). weighing-systems.com. Retrieved 8 September 2015. ^ "America's utilities prepare for a nuclear threat to the grid". The Economist. Retrieved 21 September 2017. ^ Kopp, Carlo (October 1996). "The Electromagnetic Bomb - A Weapon of Electrical Mass Destruction". USAF CADRE Air Chronicles. DTIC:ADA332511. Retrieved 12 January 2012. ^ Glasstone & Dolan 1977, Chapter 1. ^ Glasstone & Dolan 1977, Chapter 11, section 11.73. ^ Marks, Paul (1 April 2009). "Aircraft could be brought down by DIY 'E-bombs'". New Scientist. pp. 16–17. ^ Younger, Stephen; et al. (1996). "Scientific Collaborations Between Los Alamos and Arzamas-16 Using Explosive-Driven Flux Compression Generators" (PDF). Los Alamos Science (24): 48–71. Retrieved 24 October 2009. ^ "Fundamentals of Electrostatic Discharge", Compliance Magazine, 1 May 2015. Retrieved 25 June 2015. ^ "EMP Data Wipe". www.newtechrecycling.com. Newtech Recycling. Retrieved 12 June 2018. ^ a b Baum, Carl E. (May 2007). "Reminiscences of High-Power Electromagnetics" (PDF). IEEE Transactions on Electromagnetic Compatibility. 49 (2): 211–8. doi:10.1109/temc.2007.897147. ^ a b Baum, Carl E. (June 1992). "From the Electromagnetic Pulse to High-Power Electromagnetics" (PDF). Proceedings of the IEEE. 80 (6): 789–817. Bibcode:1992IEEEP..80..789B. doi:10.1109/5.149443. ^ Reuben, Charles. "The Atlas-I Trestle at Kirtland Air Force Base". The University of New Mexico. ^ "SUMMA Foundation - Carl Baum, Electrical and Computer Engineering Department, University of New Mexico". Ece.unm.edu. 17 January 2013. Retrieved 18 June 2013. ^ Protecting Personnel from Electromagnetic Fields, US Department of Defence Instruction No. 6055.11, 19 August 2009. ^ 2009 Telly Award Winners, (Manitou Motion Picture Company, Ltd.)  The U.S. Space Command video is not available to the general public. Glasstone, Samuel; Dolan, Philip J. (1977). The Effects of Nuclear Weapons. United States Department of Defense and the Energy Research and Development Administration. TRESTLE: Landmark of the Cold War (Documentary Movie), a short documentary on the SUMMA Foundation website.